Wimbledon's started! I love it. One of my sisters is going on Friday - am so jealous! - now I know that when it comes to fruit Strawberries are associated with Wimbledon - however for me, this time of year always makes me think of cherries. I know nowadays you can get most fruits all year round, but this is the time of year that cherries are in season & when I think back to my childhood - this is one of the things I loved about grass tennis season - the fact that cherries (which happen to be my favourite fruit) were in season & I would happily sit munching them whilst glued to the tennis on TV.......dreaming of the day I grew up, became a top tennis player and won wimbledon.............then as I got into my teens the dream changed to becoming a WAG of a top tennis player so I could travel the world & watch all the matches for free! hahaha...ha! 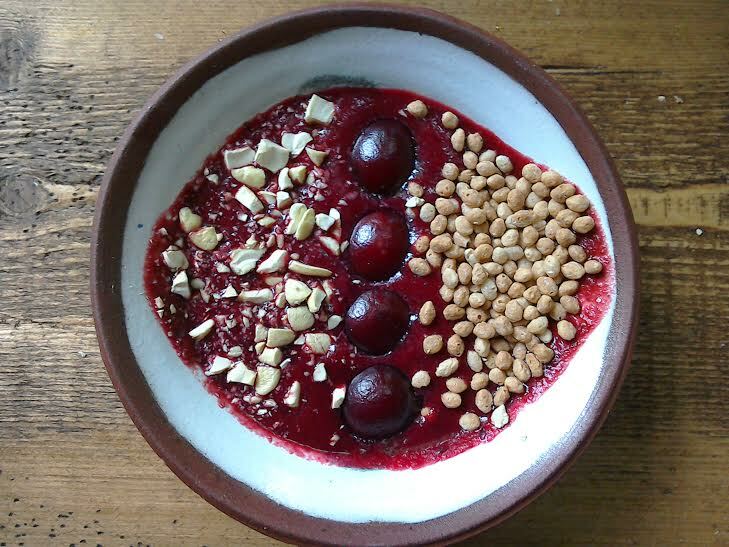 I came up with this recipe the other day when I realised that the cherries I'd bought were not quite as sweet & juicy as I like them - so I decided to chuck them into my current go to dish - which is Beet soup. It really worked so well, I had to re create and share the recipe with you. 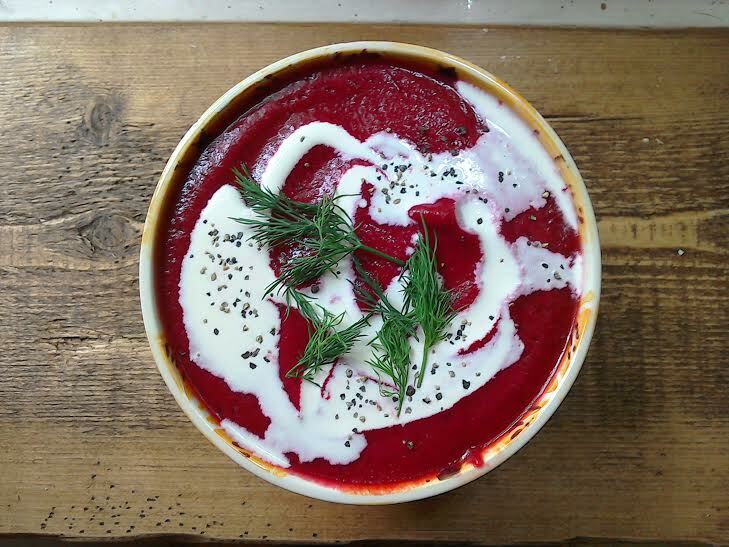 The beautiful color of this soup is almost reason enough to make it! - and Beets & cherries are both jam packed with nutrients - so this recipe ticks lots of boxes at the same time. 150g beetroots (cooked, peeled weight) - I used 4 largish beets to get this amount. 1 large sprig fresh dill. I really would encourage you use raw beets & bake them - the taste is unbeatable - they are so sweet & full of flavour, it means you don't need a lot of other ingredients or seasoning in the soup. 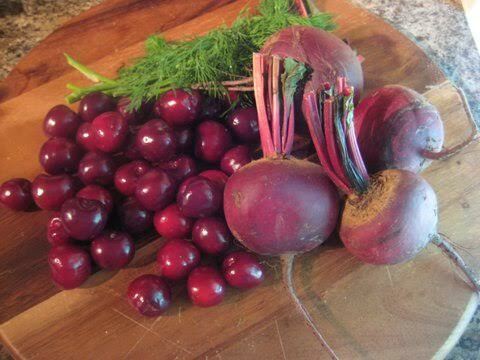 bake for 90 - 120 mins, depending on the size beets you use. when they are done the skins will have crinkled up and if you poke a knife in the centre you can tell its soft. leave to cool, then peel and slice the beets. remove the stalks and stones from the cherries. 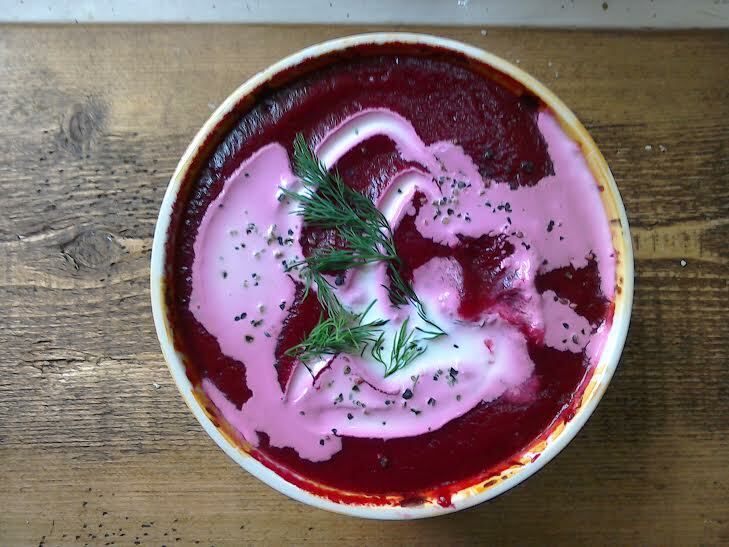 place the beets, cherries, dill, vegetable stock & vinegar into a blender & blitz. season to taste. When I asked my friend to taste test this recipe she said she added a tablespoon of cherry brandy in which made it extra delicious.........just in case you have any cherry brandy knocking about! if chilled soup is not your thing, you can replace the stock with almond milk & a pinch of cinnamon & have it for breakfast as a smoothie or smoothie bowl.